The real story, Theroux argues, is that for a better part of seven years NSA whistleblowers tried to use proper government channels to call attention to the out-of-control Leviathan surveillance state they witnessed first hand and tried to rein it in to legitimate constitutional bounds, without success. Snowdens revelations started an important public discussion, one President Obama wants to silence. Obama seeks Snowdens extradition back to the U.S. so he can be tried on felony criminal charges of theft of government property and two espionage charges. 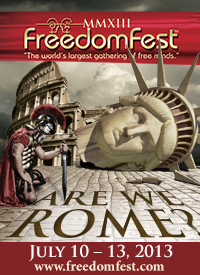 Some of the Independent Institutes most prolific Fellows will be featured on two panels at this years FreedomFest at Planet Hollywood Resort and Casino in Las Vegas, July 10-13. Fellows will be on hand to explain how liberty and free markets can revive the U.S. economy, and how government surveillance threatens civil liberties. And please visit us in the Exhibitors Hall (our booth will be at Exhibit #105). Peter J. Boettke, Benjamin W. Powell, John C. Goodman, and Anthony Gregory, all Institute fellows, will be on a panel sponsored by the Independent Institute titled No More Caesars: How Liberty and Free Markets End Crises, Protect Rights, and Create Prosperity. The panel will be moderated by Steve Moore of the Wall Street Journal and is scheduled to begin at 9:00 A.M. on Friday, July 12, in the Celebrity Room. Independent Institute Research Fellow Anthony Gregory, Terry Easton, and Randy Barnett will discuss Private Eye and Public Spying: Is Big Brother Watching? on a panel moderated by Jeffrey Tucker, Publisher and Executive Director of Laissez Faire Books. It is set to begin at 4:00 P.M. on Saturday, July 13, in the Wilshire Room. Some conservative pundits praised the Roberts decision for preventing Congress from regulating inactivity via the U.S. Constitutions Commerce Clause. Healthcare lawyer and policy analyst John S. Hoff believes this view is naïve. He spells out his analysis in the lead article for the new issue of The Independent Review. Independent Institute Senior Fellow John C. Goodman and Boston University economics professor Laurence J. Kotlikoff provide a strong dose of reality regarding the cost of Medicare. They write in the Wall Street Journal: The unfunded liability in Medicare, the trustees tell us, is $34 trillion over the next 75 years. Looking indefinitely into the future, the unfunded liability is $43 trillionalmost three times the size of todays economy. And another more plausible estimate, by the Congressional Budget Office (CBO), pegs it at more than $100 trillion. But President Obama foresees rosy savings ahead, disputed by Goodman and Kotlikoff. Which Is Worse For GDP: Spending Cuts or Tax Hikes? Senior Fellow Ivan Eland on Edward Snowden, hero or traitor?